We can be certain that life was around on Planet Earth around 3.5 billion years ago, if not before, because unmetamorphosed sedimentary rocks of that age from Western Australia in which stromatolites occur contain a black to brownish, structureless material known as kerogen. The material is a hodgepodge of organic compounds that form during the breakdown of proteins and carbohydrates in living matter. It is the source material for petroleum compounds when kerogen-rich rocks are heated during burial. The vast bulk of organic compounds preserved on Earth are in the form of ancient kerogen, whose mass exceeds that of the living biosphere by about 10 thousand times. A good sign that it does represent ancient life lies in sedimentary kerogen’s depletion in ‘heavy’ 13C compared with 12C (negative values of δ13C), because in metabolising carbon dioxide living cells preferentially use the lighter of these two isotopes. Conceivably, 13C can be removed from inorganic carbon by metamorphic processes, so low values of δ13C in metasediments from West Greenland might be organically derived or, equally, they might not. At the time of writing, geoscientists specialising in Martian matters had become excited by some results from the geochemical system aboard the surviving functional NASA rover. 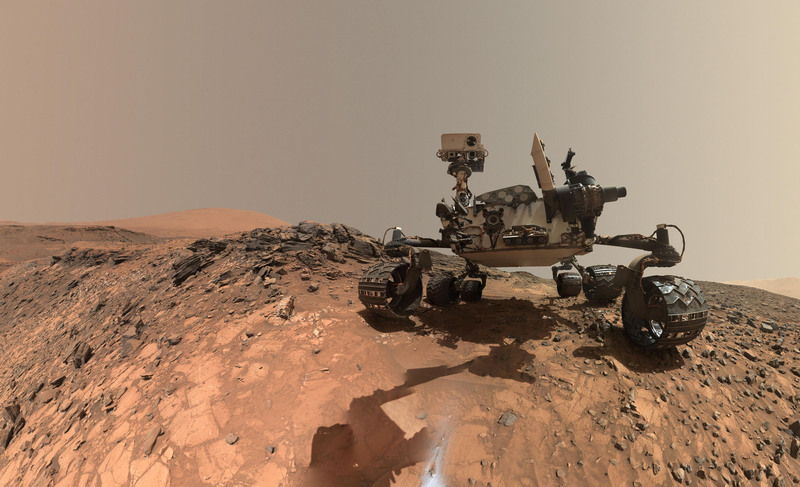 Curiosity has slowly been making its way up Mount Sharp at the centre of Gale Crater near to Mars’s equator. Analysis of high-resolution images taken from orbit suggest that the rocks forming the mountain are sediments. the lowest and oldest strata are suspected to have been deposited in a crater lake when conditions were warmer and wetter on Mars, about 3 billion years ago. Curiosity was equipped with a drill to penetrate and sample sediment unaffected by ultraviolet radiation that long ago would have destroyed any hydrocarbons exposed at the surface. In late 2016, before the rover had reached the lake sediments, the drill’s controller broke down. Since then, Curiosity had moved on to younger, less promising sediments. More than a year later mission engineers fixed the problem and the rover backtracked to try again. Heating the resulting samples to almost 900°C yields any volatile components as a gas to a mass spectrometer, results from which give clues to the molecules released.